With new and more stringent standards addressing emission reduction and fuel economy, the importance of a well-developed engine thermal management system becomes even greater. With about 30% of the fuel intake energy dissipated through the cooling system and another 30% through the exhaust system, it is to be expected that serious research has been dedicated to this field. 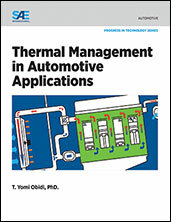 Thermal Management in Automotive Applications, edited by Dr. T. Yomi Obidi, brings together a focused collection of SAE technical papers on the subject. It offers insights into how thermal management impacts the efficiency of engines in heavy vehicles, the effects of better coolant flow control, and the use of smart thermostat and next-generation cooling pumps. It also provides an in-depth analysis of the possible gains in optimum warm-up sequence and thermal management on a small gasoline engine. With continuously increasing gadgetry in modern vehicles, the average temperature in the engine compartment has seen significant increase. It is important to be able to divert the heat away from passengers as well as from some components that may be negatively impacted by excessive temperatures. Thermal Management in Automotive Applications points out solutions to this challenge, including material and design options. If you do not have access to SAE MOBILUS via username/password or institutional access, you can still purchase the Progress In Technology (PT), Thermal Management in Automotive Applications.